Introduction: Railroads made Nashville-Franklin prime real estate and a contest of wills during the American Civil War (1861-1865). Franklin was a town located in the greater Nashville, Tennessee area and was important because vital railroads connected it to the rest of the state. Railroads allowed an army to rapidly move troops and supplies and to contest an enemy's advance, and the rails were vital for the smaller force needing reinforcements for an imminent fight. Remove the Nashville railroad junction, and Tennessee is divided into two parts. Absent Franklin, men and equipment were unable to move to and fro the eastern and western sections of the Volunteer State, as well as north and south into Kentucky and Alabama. Should this section of the state fall or be left in ruins, it would cause a circuitous route, a most costly delay, for trains transporting soldiers and supplies. With few exceptions, every major battle in Tennessee was fought along its railroads. Practically every battle of consequence was fought along the railroads of this region, and while the bridges which spanned its hills and valleys were set ablaze only to be rebuilt again, the locals would see a grand effort between the blue and gray as one destroyed and the other rebuilt during a vicious four year cycle of destruction and reconstruction as each army was determined to best the other. Lee said of a single railroad that it was the lifeline of the Confederacy. Once the remaining railroad in North Carolina was captured, Lee's Army of Northern Virginia would soon capitulate to Grant. Description: The 1863 Battle of Franklin, commonly referred to as First Franklin, was fought April 10, 1863, in Williamson County, Tennessee, during the American Civil War. It was a cavalry engagement in about the same location as the more famous Battle of Franklin, aka Second Franklin (November 30, 1864), during the Franklin-Nashville Campaign. To differentiate, most historians refer to the battles as First or Second Franklin, respectively. The 1863 engagement at Franklin was a reconnaissance in force by Confederate cavalry leader Maj. Gen. Earl Van Dorn coupled with an equally inept response by Union Maj. Gen. Gordon Granger. Van Dorn advanced northward from Spring Hill on May 10, making contact with Federal skirmishers just outside Franklin. Van Dorn’s attack was so weak that when Granger received a false report that Brentwood, to the north, was under attack, he believed it, and sent away most of his cavalry, thinking that the Confederate general was undertaking a diversion. When the truth became known—there was no threat to Brentwood— Granger decided to attack Van Dorn, but he was surprised to learn that a subordinate had already done so, without orders. Brig. Gen. David S. Stanley, with a cavalry brigade, had crossed the Harpeth River at Hughes’s Ford, behind the Confederate right rear. The 4th U.S. Cavalry attacked and captured Freeman’s Tennessee Battery on the Lewisburg Road but lost it when Brig. Gen. Nathan Bedford Forrest counterattacked. Stanley’s troopers quickly withdrew across the Big Harpeth River. This incident in his rear caused Van Dorn to cancel his operations and withdraw to Spring Hill, leaving the Federals in control of the area. 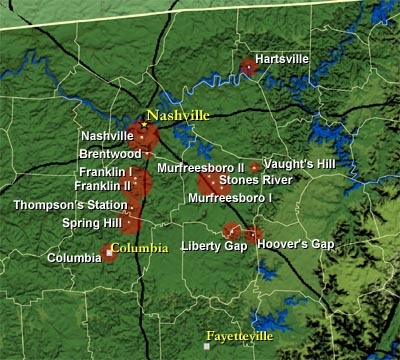 (Right) Map shows the location and proximity of the strategically important locations of Franklin, Nashville, and Murfreesboro. Hotly contested battles would take place in this region, and the ground would drink the blood of many men from opposing sides.